The transport system has a considerable impact on the landscape as a result of the building and management of roads and railways. A holistic approach to the resources, values and change processes of the landscape has become an increasingly important issue. The need of drawing up knowledge and support documentation that encompasses natural and cultural landscapes as well as issues of configuration, in an integrated manner has increased. 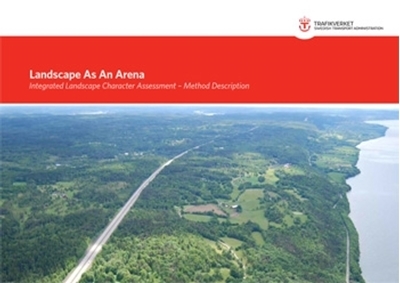 The Swedish Transport Administration needs knowledgeable employees and consultants who can understand and implement knowledge about the landscape at the planning stages and in projects.This method description is one of the tools for imparting such knowledge. The publication is printed after an order is placed. Print and delivery time is approximately eight work days within Sweden. There might be a longer delivery time for orders to other countries. The postage fee for foreign orders vary depending on the country. Please contact us if you have any questions about how to place an order or concerning price and delivery.